In a joint investigation, NBC TV stations in California analyzed data and police reports to track stolen guns in the state. The joint investigation, “Tracking California’s Guns,” was a partnership between the following NBC TV stations: KNTV, KNSD, KNBC, KCRA and KSEE. The project began when NBC Bay Area Investigates submitted a California Public Records Act request to the California Attorney General Bureau of Firearms, a division within the California Department of Justice. The agency provided a database detailing guns reported lost or stolen to California law enforcement agencies from January 1, 2010 to September 30, 2015. It contained nearly 70,000 firearms. 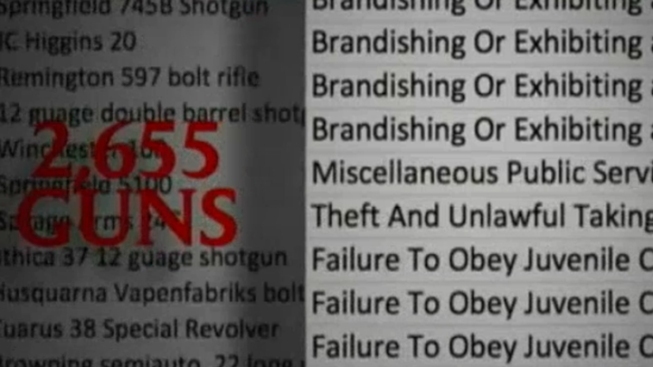 The database provided serial numbers for the guns. Serial numbers serve as unique identifiers for weapons, like a person’s social security number. To find out if any of the guns reported lost or stolen in that nearly five year period, the investigative teams submitted CPRA’s to local law enforcement agencies (police and sheriff’s departments) asking for information about guns they have seized in connection with crimes in recent years. Click here to read one of those CPRA requests. More than 70 agencies responded to the CPRA, providing 66,000 crime records. Using the unique serial numbers stamped on each weapon and found in the California DOJ database and local police records, matches between guns reported lost or stolen and those used in crimes were found. A total of 2,655. The California DOJ database included information about which agency the gun was reported lost or stolen to. It also included the date it was reported lost or stolen. Most of the data gathered from the local law enforcement agencies also included dates for when the crimes happened. The local data also included what type of crime was committed and where the crime occurred. Some agencies data was more comprehensive than others. Not all local agencies produced data in response to the CRPA requests. Those that didn’t either did not have the information or refused to provide it citing exemptions in the state public record law. The most common exemption cited was California Government Code 6254(f), which allows law enforcement agencies to withhold records that are part of an investigation. Click here to see which agencies provided records and which agencies did not.